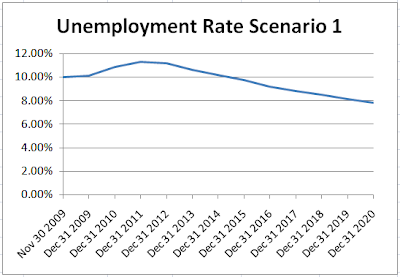 In the wake of last Friday's miracle job performance with unemployment dropping by .2% (see Jobs Contract 23rd Straight Month; Unemployment Rate Drop to 10.0%) let's take a look at unemployment scenarios offered by the Fed to see how realistic they are. Dave Rosenberg mentioned those scenarios in Breakfast with Dave on November 30, 2009. 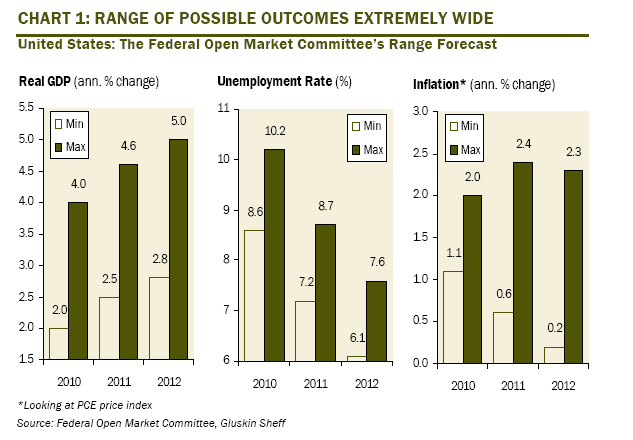 Let's start with a look at the Fed's 2012 forecast where the band is 6.1% to 7.6%. Using Bernanke's estimate that it takes 100,000 jobs a month to keep up with birthrate and demographics, the economy will have to create 260,000 jobs every month in 2010, 2011, and 2012 to hit an unemployment rate of 6.17% by the end of 2012. To get to 7.6% by the end of 2012, the economy would have to average 200,000 jobs a month for the next three years. No Genuine Driver For Jobs. The retail sector has massive overcapacity. We do not need more Home Depots, WalMarts, Lowes, Sears, Pizza Huts, Targets, Safeways, etc etc. Commercial real estate is flooded with vacant offices and plagued by falling rents. Boomers will be looking to downsize their lifestyles. There is not going to be another internet boom. It is well beyond absurd to expect the economy to average even 200,000 jobs a month, let alone 260,000 jobs a month when neither the housing boom nor the commercial real estate boom could manage those numbers over a sustained period. In short, the Fed's unemployment projections must be for some other planet or for some other alternate universe somewhere because they do not reflect reality here. That is what my baseline scenario looks like (revised today to reflect November job numbers). I am assuming there will be job gains (on average) in 2010 even though history suggests otherwise. I have the number of jobs gained per month increasing to 170,000 jobs per month for 2013 even though I think 150,000 is a more realistic maximum target for an entire year. I have +150,000 jobs for 4 consecutive years through 2016. I have the Labor Pool decreasing dramatically as a result of boomer demographics starting in 2014.This acts to lower the unemployment rate. I have the participation rate falling every year, accelerating rapidly starting in 2014 all the way through 2020. I used a labor pool increase of 120,000 a month rather than Bernanke's 100,000 a month to accommodate re-entry of marginally attached workers into the job force (people start looking for jobs because they think they may be available). Moreover, I assume there will not be a double dip recession or any recession of any kind for a decade. Note the first box on the chart contains a one month projections (for December 2009), while all the rest of the numbers are for full years. Click here for a downloadable spreadsheet where you can enter your own assumptions and create a graph for your assumptions. For details on how to use the spreadsheet and more details on my assumptions please see Mish Unemployment Projections Through 2020.